Located in the heart of Downtown Scottsdale, Old Town Scottsdale, Arizona provides residents and visitors with a taste of this area’s historic past, as well as its exciting future. The old and new come together in this remarkable neighborhood, allowing it to offer both quaint shops and restaurants, alongside art galleries and high-end shopping. This area is known for its cultural and historic draws, but is also becoming a popular place to live, thanks to its great location and character. Homes for sale in Old Town Scottsdale range in price from just $260,000 to $1.6 million, and consist of condos and single-family homes. Over 1,000 new condos have been built in this district over the past few years, and these days condos vastly outnumber single-family homes for sale. 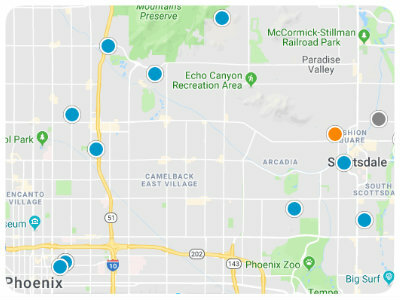 The residential boom that Old Town Scottsdale has experienced continues to boost the local economy, making it possible for the area to offer a wide range of impressive amenities. Home to Scottsdale’s main cultural district, Old Town Scottsdale also boasts one of the twenty largest malls in the country, as well as mouth-watering restaurants, bars, and nightclubs. The easily walkable neighborhoods, and eclectic neighborhood shops, cafes and museums help to round out this diverse community, making it a great place to buy a home for both families interested in convenience and good schools, and individuals looking for excitement and outdoor adventures. If you would like more information about buying a home in Old Town Scottsdale, Arizona, please do not hesitate to contact us today!